Aminosalicyclic acid, a structural analog of aminobenzoic acid, is a synthetic antituberculosis agent. Aminosalicylic acid is used in conjunction with other antituberculosis agents in the treatment of clinical tuberculosis. The drug is designated an orphan drug by the US Food and Drug Administration (FDA) for use in the treatment of tuberculosis. The American Thoracic Society (ATS), US Centers for Disease Control and Prevention (CDC), and Infectious Diseases Society of America (IDSA) currently recommend several possible multiple-drug regimens for the treatment of culture-positive pulmonary tuberculosis. These regimens have a minimum duration of 6 months (26 weeks), and consist of an initial intensive phase (2 months) and a continuation phase (usually either 4 or 7 months). Aminosalicylic acid is considered a second-line antituberculosis agent for use in these regimens. The drug usually is used in the treatment of drug-resistant tuberculosis caused by Mycobacterium tuberculosis susceptible to the drug, especially when isoniazid and rifampin cannot be used because of resistance and/or intolerance. If aminosalicylic acid is added as a new drug to a regimen in patients experiencing treatment failure who have proven or suspected drug-resistant tuberculosis, at least 2, preferably 3, new drugs known or expected to be active against the resistant strain should be added at the same time. After results of in vitro susceptibility testing are available, the regimen can be adjusted accordingly. Aminosalicylic acid has been used in the treatment of mild to moderate ulcerative colitis in patients who are intolerant of sulfasalazine and in the treatment of Crohn’s disease; the drug is designated an orphan drug by the FDA for use in these conditions. Aminosalicylic acid is administered orally. Although aminosalicylic acid has been administered IV, a parenteral dosage form of the drug is not commercially available in the US. Commercially available aminosalicylic acid granules (Paser®) have an acid-resistant coating that dissolves promptly (within 1 minute) at neutral pH such as that found in the small intestine or in neutral foods. Therefore, the granules should be administered in an acidic food or drink having a pH less than 5, such as applesauce, yogurt, or fruit juice. The manufacturer states that the following juices have been tested and are suitable for administration of the granules: orange, apple, tomato, grapefruit, grape, cranberry, “fruit punch.”102 When administered in fruit juice, the granules sink but can be resuspended by swirling. Paser® granules mixed with an acidic food should be swallowed without chewing. The manufacturer states that the acid-resistant coating will last at least 2 hours in these acidic foods or drinks. Patients in whom stomach acid has been neutralized by concurrent administration of antacids do not need to administer Paser® granules in an acidic food or drink. In the treatment of clinical tuberculosis, aminosalicylic acid should not be given alone. The drug is considered a second-line agent for use in daily multiple-drug regimens for the treatment of active tuberculosis. Data are not available to date regarding use of aminosalicylic acid in intermittent multiple-drug regimens used in the treatment of tuberculosis. Therapy for tuberculosis should be continued long enough to prevent relapse. The minimum duration of treatment currently recommended for patients with culture-positive pulmonary tuberculosis is 6 months (26 weeks), and recommended regimens consist of an initial intensive phase (2 months) and a continuation phase (usually either 4 or 7 months). However, completion of treatment is determined more accurately by the total number of doses and is not based solely on the duration of therapy. For information on general principles of antituberculosis therapy and recommendations regarding specific multiple-drug regimens and duration of therapy. The manufacturer states that the usual adult dosage of aminosalicylic acid for use in conjunction with other antituberculosis agents is 4 g 3 times daily in adults or a correspondingly smaller dose in children. The American Thoracic Society (ATS), US Centers for Disease Control and Prevention (CDC), and Infectious Diseases Society of America (IDSA) state that the usual dosage of aminosalicylic acid for use in conjunction with other antituberculosis agents in adults and children 15 years of age or older is 8-12 g daily given in 2 or 3 doses; however, a dosage of 4 g twice daily is adequate to achieve target serum concentrations of the drug. The dosage of aminosalicylic acid recommended by the ATS, CDC, and IDSA for pediatric patients is 200-300 mg/kg daily given in 2-4 divided doses. The most frequent adverse effects of aminosalicylic acid are GI disturbances including nausea, vomiting, abdominal pain, and diarrhea. Rarely, aminosalicylic acid has caused peptic ulcer and gastric hemorrhage. Adverse GI effects may be minimized in some patients by administering the drug with meals; however, symptoms may be severe enough to require discontinuation of the drug. Malabsorption of vitamin B12, folic acid, iron, and lipids has occurred occasionally in patients receiving aminosalicylic acid, possibly as the result of increased peristalsis. As a result of competition, a 5-g dose of aminosalicylic acid may reduce absorption of vitamin B12 by about 55% and clinically important erythrocyte abnormalities may develop after depletion. The manufacturer states that maintenance therapy with vitamin B12 should be considered in patients receiving aminosalicylic acid for longer than 1 month. Hypersensitivity reactions including fever, skin eruptions of various types, pruritus, vasculitis, exfoliative dermatitis, joint pain, eosinophilia, leukopenia, agranulocytosis, thrombocytopenia, hepatitis, and jaundice have been reported in patients receiving aminosalicylic acid. Loffler’s syndrome, an infectious mononucleosis-like or lymphoma-like syndrome, encephalopathy, hypoglycemia, pericarditis, optic neuritis, hypoprothrombinemia, and psychotic reactions have also been reported in patients receiving aminosalicylic acid. Retrospective analysis of cases of drug induced hepatitis in patients receiving an antituberculosis drug regimen including a rapidly absorbed aminosalicylic acid preparation suggests that manifestations of hepatitis usually occur within 3 months after initiation of therapy. Rash is the most common symptom; this often is followed by fever and GI disturbances (e.g., anorexia, nausea, diarrhea) occur much less frequently. In patients diagnosed with aminosalicylic acid-induced hepatitis, hepatomegaly was invariably present and was often accompanied by leukocytosis, lymphadenopathy, and/or eosinophilia. The manufacturer states that if manifestations of hypersensitivity occur (e.g., rash, fever), all drugs should be discontinued immediately; when the symptoms have abated, the drugs may be reinstituted cautiously one at a time in small and gradually increasing doses to determine whether the manifestations were drug-induced and, if so, which drug was responsible for the reaction. Aminosalicylic acid may cause Coombs’-positive hemolytic anemia and hematuria in patients with glucose-6-phosphate dehydrogenase deficiency. Hypokalemia, acidosis, albuminuria, and crystalluria have occurred occasionally in patients receiving aminosalicylic acid. Crystalluria may be prevented by maintaining the urine at a neutral or alkaline pH. Goiter, with and without myxedema, has been reported in patients receiving prolonged high-dose therapy with some aminosalicylic acid products (not Paser® granules). The manufacturer of Paser® states that occasional goiter development can be prevented by administration of thyroxine but not iodide. Aminosalicylic acid is contraindicated in patients who are hypersensitive to aminosalicylic acid or any component of the formulation. The manufacturer states that aminosalicylic acid also is contraindicated in patients with severe renal disease. Patients must be monitored carefully during the first 3 months of aminosalicylic acid therapy. Patients should be advised to discontinue the drug immediately at the first signs of hypersensitivity (e.g., rash, fever, and much less frequently, anorexia, nausea, or diarrhea) and contact their clinician. The manufacturer states that desensitization to aminosalicylic acid has been accomplished successfully in 15 of 17 patients using the following regimen. After an initial dose of 10 mg, the dosage of aminosalicylic acid is doubled every 2 days until a total daily dosage of at least 1 g is reached; dosage escalation is then continued by administering the total daily dosage in divided doses according to the usual administration schedule (i.e., 3 times daily). If a mild temperature elevation or skin reaction develops during the desensitization procedure, the manufacturer states that desensitization may be continued by decreasing the dosage by one increment (i.e., to the previous level at which no reaction occurred) or maintaining the current dosage for another 2-day cycle before continuing the dosage progression. The manufacturer states that such reactions are rare after a total daily aminosalicylic acid dosage of 1.5 g is reached. Aminosalicylic acid should be used with caution in patients with impaired renal or hepatic function and in patients with gastric ulcer. The manufacturer states that patients with hepatic disease may tolerate aminosalicylic acid less well than those without such disease, even though the metabolism of the drug in patients with hepatic disease has been reported to be comparable to that in healthy individuals. Patients receiving aminosalicylic acid granules (Paser®) should be advised that the matrix of the granules may be seen in the stool. Safe use of aminosalicylic acid during pregnancy has not been established and the drug should be used during pregnancy only when clearly needed. The American Thoracic Society (ATS), US Centers for Disease Control and Prevention (CDC), and Infectious Diseases Society of America (IDSA) state that, although aminosalicylic acid has been used safely during pregnancy, the drug should be used in pregnant women only when there are no alternatives for the treatment of multidrug-resistant tuberculosis. Aminosalicylic acid is distributed into milk. Certain aminosalicylic acid preparations have been reported to impair GI absorption of rifampin, resulting in decreased serum concentrations of the drug. This effect appears to be caused by bentonite, an excipient not currently included in commercially available aminosalicylic acid granules (Paser®). The manufacturer of Paser® states that oral administration of a solution containing both aminosalicylic acid and rifampin demonstrated full absorption of each drug. Aminosalicylic acid appears to reduce the rate of acetylation of isoniazid; the effect usually is not clinically important. The manufacturer states that this effect has not been studied with Paser® but that the lower serum concentrations produced by this delayed-release preparation should result in a reduced effect on the acetylation of isoniazid. Concomitant probenecid has been reported to increase serum concentrations of aminosalicylic acid, at least transiently, and it has been suggested that probenecid be used with caution in patients receiving aminosalicylic acid. However, limited data available to date suggest that concurrent administration of these drugs does not result in clinically important increases in aminosalicylic acid concentrations. Diphenhydramine impairs GI absorption of aminosalicylic acid; therefore, concurrent administration of the drugs should be avoided. Aminosalicylic acid may decrease GI absorption of digoxin, possibly by altering properties of the intestinal wall. After 2 weeks of concomitant oral administration of aminosalicylic acid and digoxin, a 20% decrease in absorption of digoxin has been reported. There is some evidence that aminosalicylic acid may enhance the hypoprothrombinemic effect of oral anticoagulants; dosage adjustments of the anticoagulants may be necessary. Ammonium chloride should not be used in patients receiving aminosalicylic acid because of the increased probability of crystalluria during therapy. Aminosalicylic acid has been reported to interfere technically with serum determinations of albumin by dye-binding and AST (SGOT) by the azoene dye method, and with qualitative urine tests for ketones, bilirubin, and urobilinogen or porphobilinogen. Aminosalicylic acid reportedly causes false-positive results with cupric sulfate solution (Benedict’s reagent) for urine glucose determinations. Aminosalicylic acid is bacteriostatic in action. The mechanism of action of the drug is similar to that of sulfonamides. Aminosalicylic acid prevents the synthesis of folic acid in susceptible organisms by competitively blocking the conversion of aminobenzoic acid to dihydrofolic acid. The activity of aminosalicylic acid may be partially inhibited by aminobenzoic acid. 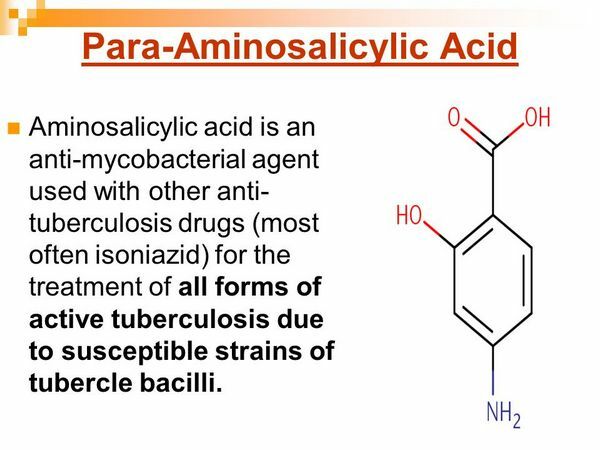 Aminosalicylic acid is a highly specific agent and is active only against Mycobacterium tuberculosis. In vitro, the minimum inhibitory concentration (MIC) of aminosalicylic acid for most susceptible M. tuberculosis is 0.5-2.0 mcg/mL. Aminosalicylic acid is not active in vitro against Mycobacterium avium. Natural and acquired resistance to aminosalicylic acid have been demonstrated in vitro and in vivo. Resistant strains of initially susceptible organisms develop rapidly if aminosalicylic acid is used alone in the treatment of clinical tuberculosis. When aminosalicylic acid is used in conjunction with other antituberculosis agents in the treatment of the disease, emergence of resistant strains may be delayed or prevented. There is no evidence of cross-resistance between aminosalicylic acid and other antituberculosis agents currently available in the US. Aminosalicylic acid is readily absorbed from the GI tract. The manufacturer states that after 2 hours in simulated gastric acid, 10% of a dose of unprotected (nonenteric coated) aminosalicylic acid is decarboxylated to form m-aminophenol, a known hepatotoxin. The acid-resistant coating of Paser® granules protects against degradation of the drug in the stomach; in addition, the small granules are designed to escape the usual restriction on gastric emptying of large particles. Following administration with food of a single 4-g oral dose of aminosalicylic acid as enteric-coated granules (Paser®) in healthy adults, peak serum aminosalicylic acid concentrations averaged 20 mcg/mL (range: 9-35 mcg/mL). The median time to peak serum concentrations was 6 hours (range: 1.5-24 hours). A serum concentration of 2 mcg/mL was achieved in 2 hours (range: 0.75-24 hours) and maintained for an average of 7.9 hours (range: 5-9 hours), while a serum concentration of 1 mcg/mL was maintained for an average of 8.8 hours (range: 6-11. hours). Following a single 4-g oral dose of aminosalicylic acid as tablets or suspension (not commercially available in the US) in healthy adults, peak plasma concentrations of 41-68 mcg/mL were attained within 3-4 hours. 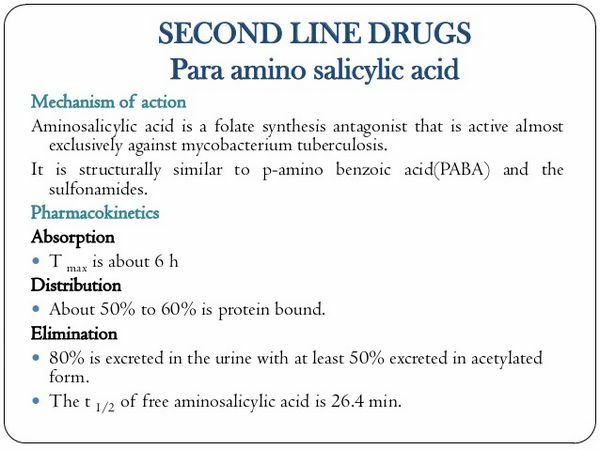 Aminosalicylic acid is distributed into various tissues and fluids including peritoneal fluid, pleural fluid, and synovial fluid in concentrations approximately equal to plasma concentrations of the drug. CSF concentrations of aminosalicylic acid are reported to be 10-50% of concurrent plasma concentrations of the drug in patients with inflamed meninges. It is not known if aminosalicylic acid crosses the placenta. Small amounts of the drug are also distributed into milk and bile. Aminosalicylic acid is 50-73% bound to plasma proteins; protein binding reportedly is reduced by 50% in kwashiorkor. The plasma half-life of aminosalicylic acid is approximately 1 hour. Plasma concentrations of the drug are not substantially affected by renal or hepatic insufficiency; however, the half-lives of the inactive metabolites may be prolonged in patients with impaired renal function. Aminosalicylic acid is inactivated in the intestinal mucosa and liver primarily by acetylation. The major metabolites are N-acetyl-p-aminosalicylic acid and p-aminosalicyluric acid. The degree of metabolism is concentration-dependent and capacity-limited; the larger the dose absorbed, the lower the percentage of drug metabolized. Aminosalicylic acid and its metabolites are excreted in urine by glomerular filtration and tubular secretion. Following a single 4-g dose of aminosalicylic acid in adults with normal renal function, approximately 77% of the dose is excreted in urine within 24 hours; 56% is excreted as the acetylated metabolite. Aminosalicylic acid and its acetyl metabolite accumulate in patients with severe renal disease. Continued acetylation of the parent drug leads exclusively to accumulation of the inactive acetylated form; deacetylation, if it occurs, is minor. The manufacturer states that aminosalicylic acid passes dialysis membranes but the frequency of dialysis usually is not comparable to the half-life of 50 minutes for the free acid. Aminosalicylic acid, a structural analog of aminobenzoic acid, is a synthetic antituberculosis agent. Aminosalicylic acid occurs as a white or practically white, bulky powder which may have a slight acetous odor and is slightly soluble in water and soluble in alcohol. Aminosalicylic acid has a pKa of 3.2. Aminosalicylic acid is commercially available in the US as off-white tan, enteric-coated granules (Paser®) designed for gradual release of the drug. Aminosalicylic acid deteriorates rapidly if exposed to moisture, heat, or light. Commercially available aminosalicylic acid granules (Paser®) should be stored in a refrigerator or freezer, but may be stored at room temperature for short periods of time. Exposure to excessive heat should be avoided. Aminosalicylic acid granules should not be used if the airtight package containing the drug is swollen or if the granules have lost their tan color and are dark brown or purple.